Collegno, 17 January 2014 – Prima Industrie, leading specialist in laser and sheet metal fabrication machinery and industrial electronics headquartered in Torino (Italy), has been named as one of the ten finalists in the category “The Infosys Business of the Year Award with turnover of €150m or higher”. Prima Industrie will now go on to compete in the third and final round of judging resulting in 10 overall category winners to be announced in May. 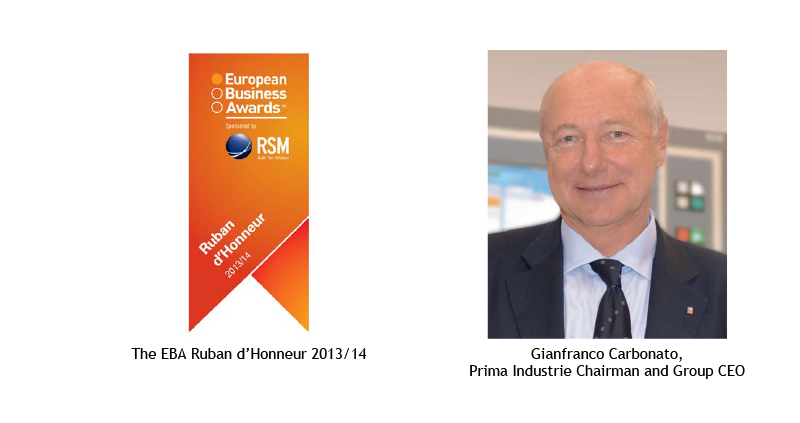 Gianfranco Carbonato, Prima Industrie Chairman and Group CEO, declared: “We are extremely proud to be named as finalist for this prestigious award and to represent Italy. We are honoured to be recognized as a dynamic company with strong growth and innovation strategies, and market leadership in our sector. The European Business Awards is widely recognised as the showcase for Europe’s most dynamic companies and we are now looking forward to describing to the judges in more detail how we are achieving business success.”Prima Industrie heads a leading Group in designing, manufacturing and marketing of laser systems for industrial applications, sheet metal processing machinery, and industrial electronics and laser sources. With over 35 years of experience, the Group has installed over 10,000 machines in more than 70 countries worldwide and is among the leading worldwide manufacturers in its market. It employs over 1,500 people and has manufacturing sites in Italy, Finland, USA, and China as well as a worldwide commercial and after-sales presence. The Prima Industrie Group is organized into two Divisions: Prima Power, with a wide product portfolio of laser and sheet metal fabrication machinery, and Prima Electro, operating in the field of industrial electronics and high-power laser sources. The parent company, Prima Industrie S.p.A., is listed on the Italian Stock Exchange since 1999 (MTA – STAR segment). For more information, please visit www.primaindustrie.com.